In Chapter 13 of the second edition of Amelia Earhart: The Truth at Last, titled “Griswold, Henson and Burks,” I present the story of Capt. Tracy Griswold and Privates Everett Henson Jr. and Billy Burks, the three Marines who excavated what might well have been the remains of Amelia Earhart and Fred Noonan from a gravesite just outside the Liyang Cemetery, on the outskirts of southern Garapan, in late July or early August 1944. The original version of the chapter included the strange account of Ellis Bailey, whose incredible story, if true, would have lent great credibility to the claims of Henson and Burks, who were told by Griswold that they had just excavated the remains of Amelia Earhart. Twenty-one years later, they both separately identified Griswold from photo lineups, while the former Marine Intelligence captain denied ever knowing them or ordering them to excavate skeletal remains on Saipan. I was reluctant to include Bailey’s story in The Truth at Last, because it did nothing to advance the truth, so I decided to cut his section from the final manuscript. I still feel it’s quite instructive, in that it shows the extreme lengths that some of the Earhart-addled will go to gain attention. The Earhart chase has badly infected some with its own peculiar strain of fever, and those carrying the bug can usually be identified by their ridiculous claims. The recent History Channel imbroglio, which I have written about at length, is a prime example of this awful malady. Earhart lore is replete with many other examples, but Bailey’s fantasy, at least for me, was one of the most believable, well-conceived fabrications ever; it certainly caught my attention and spurred me to make a serious effort to confirm it. USS Vega (AK-17), circa late 1930s. 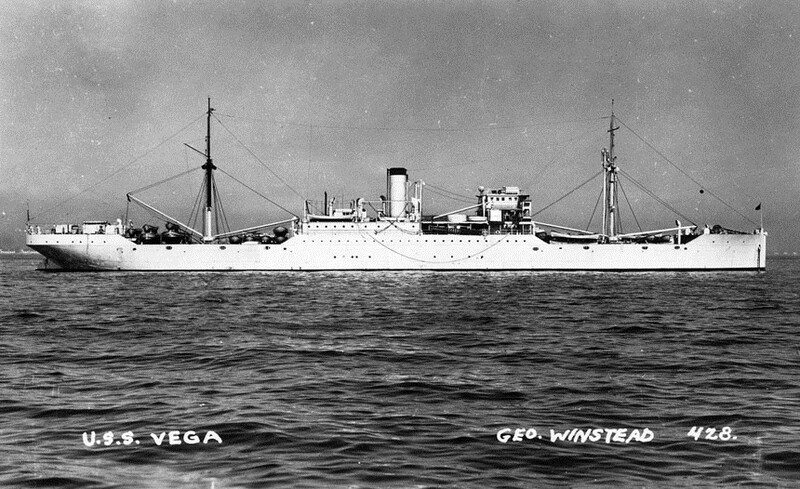 Vega was a Sirius-class cargo ship, laid down July 8, 1918, launched July 18, 1919 and commissioned at the Boston Navy Yard on Dec. 21, 1921. She was at Pearl Harbor during the Japanese attack of Dec. 7, 1941, but was not damaged, and in 1944-1945, Vega supported three major amphibious operations — in the Marianas, the Western Carolines and at Okinawa — carrying supplies and construction materials to assist the “Seabees” in establishing the advance bases necessary to the smooth operation of the Fleet. For a time, it did appear that a series of amazing letters forwarded to me by Bill Prymak in 2008 might hold the key to unlocking the next stage of the government’s top-secret operation to return the fliers’ bones to the United States in 1944. Below is the unpublished section of Chapter 13 of Truth at Last, “Griswold, Henson, and Burks.” Obviously, this passage will make far more sense to those who have the book, and can place it in the original context. 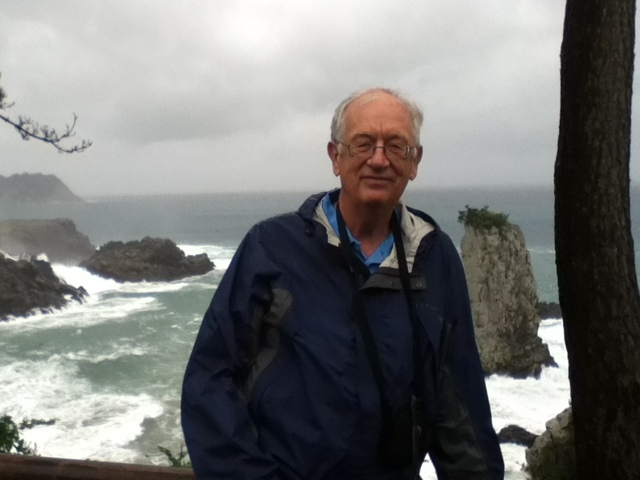 Between 1991 and 1999, Ellis Bailey, of Middletown, Iowa, wrote seven letters to Prymak, describing a series of remarkable events he witnessed aboard the USS Vega (AK-17), a Capella class cargo ship that carried a crew of 439 and displaced 11,500 tons, during operations off Saipan and in the Marshall Islands during July and August 1944. Bailey’s recollections of the remarkable incidents remained clear and consistent throughout his letters, and though he offered his own strange ideas about the meaning and the significance of the events, the core of Bailey’s account never changed. He never indicated his Navy rating, or job, in his letters, but a copy of the “Muster Roll of the Crew” of USS Vega for Sept. 30, 1944, shows that Bailey was a storekeeper first class (SK1). In Bailey’s final letter to Prymak, titled “Amelia Earhart,” he recalled that Vega came to Saipan the “first part of July 1944,” and that after dropping anchor a group of Marines came aboard and informed Bailey and others that someone had just found “Amelia Earhart’s helmet,” somewhere on the island, but they offered no details. The next day, Bailey “got permission to go ashore,” and “tried to visit Aslito Airfield” but was told it was restricted and off-limits. “While waiting for a ride back to the ship I talked to boat crew members who were discussing an important meeting of top General and Admirals,” he wrote. “One had come in that day. The Secretary of the Navy, James Forrestal, was there and he probably called the meeting.” With this, Bailey joined the handful of GIs claiming knowledge of Forrestal’s presence on the island during the invasion – an allegation that has never been officially confirmed, and which further research indicated was not possible. The next day, the intelligence officer, who had “no insignia but lots of authority,” came aboard with two boxes, “the remains of the flyers,” according to Bailey. “They were taken to the bridge and put under 24-hour guard,” he wrote, and the captain was ordered to steam to Majuro. Four days later Vega reached the Marshalls capital, Majuro, and while waiting for a “whale boat to be lowered to take him to shore,” the intelligence officer, apparently addressing Bailey, said, “I expect you are wondering why you are here. Seven years ago two Caucasian flyers were lost at sea. One was a woman. I came to see and talk with the two natives that had seen and talked with the flyers.” The agent returned to the ship the next morning, and ordered the captain to set sail for Kwajalein. Upon arrival at Kwajalein, a small contingent of Marines came aboard and “told us that the day before one of their group was on . . . Roi Namur, [and] found Amelia Earhart’s suitcase of clothes and her diary in a barracks,” Bailey continued. “They had taken it to the man in charge of Kwajalein [Rear Admiral Alva D. Bernhard, who died in 1955]. The government officer with no insignia took the guarded boxes of the remains and left the U.S.S. Vega at once.” According to Bailey, the agent never mentioned any names in connection to the boxed remains, and Bailey himself didn’t believe the bones were those of Earhart or Noonan. The remains “weren’t the American flyers, they were British, which makes the whole situation so confusing,” Bailey wrote. The Marines’ story about the discovery of Earhart’s suitcase, clothes, and diary on Roi Namur mirrored W.B. Jackson’s 1964 account to Fred Goerner, but Bailey’s story began to unravel when it became apparent their find did not occur “the day before,” Vega arrived, as Bailey wrote, because Kwajalein was secured in early February 1944, and by April 1, four months before Vega allegedly arrived at Kwajalein, 14,000 thousand Americans occupied the main island, with 6,500 more on Roi-Namur. Bailey’s repeated references to the “British flyers” lost at sea at the same time as the Earhart flight must have originated with The Earhart Disappearance: The British Connection, by James A. Donahue, among the most bizarre Earhart conspiracy books ever. 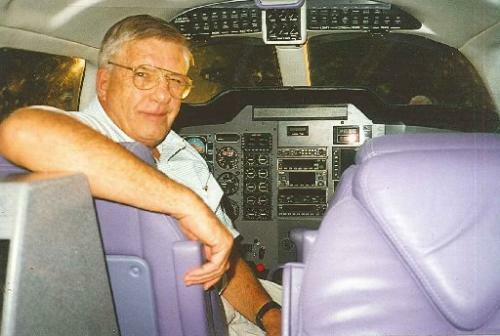 Contrary to Donahue’s fanciful scenarios, no evidence has ever supported the idea that two British flyers, male and female, were operating anywhere in the Pacific area at that time. Writing to Ron Reuther in 1992, Goerner described The British Connection with Robert Myers’ Stand By To Die as one that “perfectly represents the totally irresponsible weirdo fringe which has been omnipresent in the Earhart matter since 1937.” In The British Connection, Donahue “has used photos and benign basic research and stitched the wildest kind of fiction to them and it is without any proof or ANY reference to source,” Goerner wrote. Bailey’s imaginative ramblings reflected a few of the most implausible scenarios found in Earhart literature, but the remote possibility that his story about the intelligence agent and the canisters might be true was too compelling for me to immediately dismiss out of hand. Admittedly, I hoped against hope that Bailey’s story would prove to be true. If it were, another missing piece in the Earhart puzzle — the transport of the fliers’ remains off the island of Saipan — could be placed into the final solution. 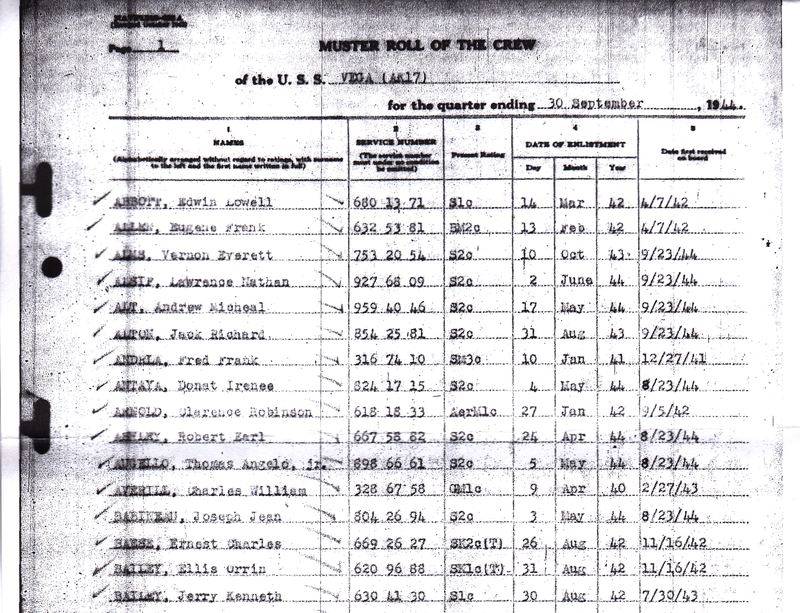 This is page 1 of the “Muster Roll of the Crew” of USS Vega for Sept. 30, 1944. Ellis Orrin Bailey is listed second from the bottom, along with his rating, SK1 (Storekeeper First Class), followed by his date of enlistment and date he reported aboard, Nov. 16, 1942. According to one source, Vega’s normal contingent was 36 officers and 413 enlisted men. Bailey’s affiliation with Vega was about the only thing he was honest about in his letters to Bill Prymak. My efforts to find any surviving members of the 1944 Vega crew who might have corroborated Bailey’s story were unsuccessful, but Tony Gellepis, of Santa Clara, Calif., a fireman aboard Vega from 1940 to 1942, was skeptical about Bailey’s alleged shore visit at Saipan during early July 1944. “In all my six years experience on various supply ships, shore leave was never granted while the ship was ‘swinging on the hook [anchored in the harbor],’ especially so during war time,” Gellepis, 87, told me in a July 2008 email. “Shore leave was granted only after the ship was docked and secured, if at all. And Bailey claims he went ashore the next day while Vega was at anchor! And this guy was set to go to Aslito Field? Incredible! I consider this to be a stretch, an embellishment.” Gellepis passed away in 2016 at age 96. Much to my disappointment, a November 2008 trip to the nearby National Archives and Records Administration in College Park, Md., to verify Bailey’s affiliation with Vega and its purported movements during the key dates, confirmed that Prymak and Gellepis’ doubts were well founded. Vega’s deck logs for July and August 1944 reveal the ship was not at Saipan in early July, as Bailey claimed, but anchored at Eniwetok Atoll, in the Marshall Islands, though July 21, when it left for Saipan, arriving July 25. Vega anchored in Tanapag Harbor until July 31, per Bailey’s account, but then departed for Guam – not Majuro – in convoy with the cargo ship USS William Ward Burroughs (AP-7), LST (landing ship tanks) 341, and the destroyers USS Stockham (DD-683) and USS Trisdale (DE-33), reaching Guam Aug. 1. Without doubt, the ranks of the Earhart-addled have not been yet filled, as the lure of instant attention and imagined fame is usually sufficient to ensnare these unprincipled characters in its unsavory web. Your humble correspondent will keep a sharp lookout, and if the story is wild or ridiculous enough to merit mention, you’ll see it here.